Come fall, I get excited about a few things: wearing my purple scarf, pulling on my black boots and drinking spiced apple cider. If I can do all three in the same day, even better. Especially if there’s a good book and a warm wood stove involved. The scarf and boots are a fairly recent addition to my fall favorites, but I’ve always been a fan of spiced apple cider. Frankly, I’m happy to drink it any time of year – be it 80 degrees out or freezing. It’s just so good! 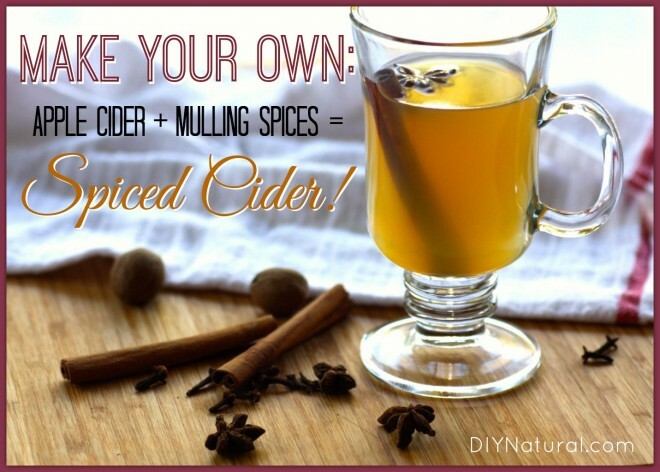 But last year I discovered how easy it is to make a new favorite – DIY spiced apple cider. First, you need some apple cider, which you can buy or make yourself. Frankly, this is something I buy, but I think I’ll make it next time since it seems pretty simple. Fresh cider is raw apple juice that has not undergone a filtration process to remove coarse particles of pulp or sediment. It takes about one third of a bushel (about 40 medium apples) to make a gallon of cider. To make fresh cider, apples are washed, cut and ground into a mash that is the consistency of applesauce. Layers of mash are wrapped in cloth, and put into wooded racks. A hydraulic press squeezes the layers, and the juice flows into refrigerated tanks. This juice is bottled as apple cider. Wash, quarter and core the apples. Put them in the blender (you may need to do a few batches if your blender won’t hold all of the apples). Puree the apples. Using cheesecloth, squeeze as much juice out as possible into a bowl. Or put the strainer over a bowl and pour the puree into the strainer. You may need to use the back of a spoon to press the juice through. This is a great project for the fall, when fresh apples are aplenty and much cheaper than any other time of year. Next, you need to make some mulling spices. It’s pretty easy and you may only need a quick trip to the bulk bin of your favorite store (or a visit to website that sells bulk spices) to get any of the spices you don’t already have on hand. Place all of the ingredients into a mason jar, put on the cap and shake until it’s well-mixed. Don’t forget a label! Measure the apple cider and pour it in the sauce pan. Turn on your stove and bring the cider to a simmer. Let it simmer for at least 5 minutes. Carefully remove the muslin sack from the cider (I use tongs). If you didn’t use the muslin, carefully strain the spices from the cider. I typically put the strainer over my mug and pour, but, of course, you have to be super careful. *For a dessert drink, add a couple teaspoons of homemade caramel sauce and top with homemade whipped cream. Be warned, though, it’s addicting! Nina is a writer, student midwife, and mama of four. She blogs regularly at Shalom Mama and loves helping others create wellness through simple living. Check out her website for more simple wellness tips and connect with her on her Nina Nelson G+ profile. Whether it’s soft or hard, it’s marvellous mulled! I should add that it’s worth experimenting with ground ginger and cardamom. If you have a thrift store near you, you might find a deal on a juicer. I bought one at my Humane Society thrift store for $8, and it works great. It saves a lot of work since it separates the juice from the remainder of the the apples. Makes great cider!